Shown with our Molded Beeswax Candle and 1602 Candle Follower, sold separately. 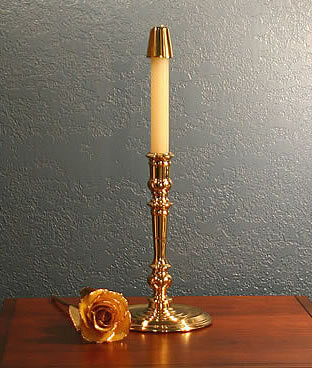 Our Essex candlestick is a lovely heirloom quality piece in solid brass that measures 8" high X 5" base. The brass is lacquered to keep it shining, the base is felted to protect fine finishes.Weight: 2 pounds, 1 1/4 ounces. Another gorgeous candlestick - I have ordered several and been extremely pleased with them all. I had reservations about ordering an imperfect item, but everything has been perfect. wonderful quality. I purchased a set of Essex Candlesticks. They are for the altar and will be handled and used by many. When they arrived I was stunned as they are wonderful and will be perfect for what I purchased them for. Thank you for the prompt service and great products. Essex, Massachusetts is located on the Atlantic coast and is north of Boston. Until its incorporation in 1819, it was part of Ipswich known as Chebacco Parish. Essex was a renowned shipbuilding town. More than 5,000 ships were built there, including most of the famous Gloucester fishing schooners.